First things first, you need to get lots of sleep! With the excitement of the upcoming nuptials it can be tempting to stay up late. However, a full night of zzzz will give you the glow you need for your photos and the energy needed to dance the night away. Its a win win! Just in case you need some help though, here are 7 Tips for Falling Asleep at Bedtime curtesy of Bustle. Now that you're well rested, how about a morning yoga session with your bridesmaids? Before all the hustle and bustle, get your girls together for a quick 10 minute yoga routine. This will not only wake you up, but it will also help release any extra tension or anxiety you're feeling. Plus, it looks like fun! 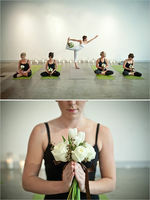 Check out this Unique Yoga Zen Bridal Shoot for some zen-spiration. Everybody knows that spending time with cute little puppies is a great way to unwind and let all of your cares float away. We LOVE the brilliant idea this bride had, to hold rescue puppies instead of bouquets for their group shots. The puppies also got to play with the groomsmen. See more of our cute furry friends here, courtesy of Refinery 29. Try using essential oils. Softening scents can help sooth your soul and allow you to relax. Lavender is our favorite feel good scent and it's easy to use, just dab some on your wrists to calm the bridezilla within. Don't have any Lavender oil on hand? Try lighting a Lavender scented candle for similar benefits. 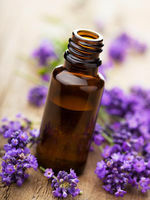 Check out 30 Ways to Use Lavender Essential Oil for more awesome ideas. Before you say "I do", send each other love notes with words of encouragement to share on your big day. It will help ease your nerves and remind you what your wedding is really about. Also, it's the cutest idea ever and we're totally loving it. Photo curtesy of Breakers Wedding Blog. Delegate, delegate, delegate! Its ok to be nervous on your wedding day (in fact, its completely normal) so dont be afraid to ask for help from your friends and family. Also, don't forget to have fun! That means lots of selfies with your bridal party. Check out these cute matching pj sets from Pretty Plum Sugar! Opt to be cell phone free on your big day and designate a bridesmaid to answer any calls or texts that come in. The last thing you need to worry about is Uncle John getting lost. Now, that doesn't mean you can't have a bit of fun (remember, it's important to have fun!) Check out this adorable Bride and Bridesmaids DIY Printable Cell Phone Case here by Something Turquoise. Now that your cell phone is taken care of, choose someone else to handle any last minute changes. In the event something traumatic happens - you should really be the last to know. This will give you total freedom to focus on having fun with your loved ones. Photo curtesy of Donna Morgan wedding inspiration. Time to eat! Its so important to not skip meals on any day, let alone your wedding day. Make sure you enjoy the food you paid for! After all, this is the first meal you'll be enjoying with your new spouse, so savor every bite. If you're loving this chalkboard menu, here is a great tutorial on How to Draw Like and Artist on a Chalkboard by In My Own Style. Photo by Brianna Venzke Photography. Take a step back and soak it all in. Your wedding day will fly by quickly, which makes enjoying those small moments so memorable after it's all said and done. Photo by Hochzeitslicht. Imperfections are what make your day beautiful, and theyre bound to happen so why not embrace them? In 10 years youll hopefully be laughing about them anyway. It's time to let loose and celebrate your marriage and remember, don't sweat the small stuff! It's all part of what makes your day perfect. Photo by Ryan Flynn Photography.